I spent last week in France, at a folk music festival in Brittany (physicists have a life too). 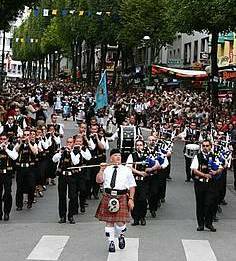 Originally a piping festival, the annual Festival Interceltique de Lorient is probably the largest celtic music festival in the world, with parades, concerts and performances from pipe bands, music groups, dance troupes from all the great celtic nations. The sheer scale of the celtic world could be seen from the number of delegations – from Asturias (Spain), Galicia (Spain), Brittany (France), Cornwall (England), Scotland, Wales, Ireland, Acadia (Canada), Australia and the Isle of Man. 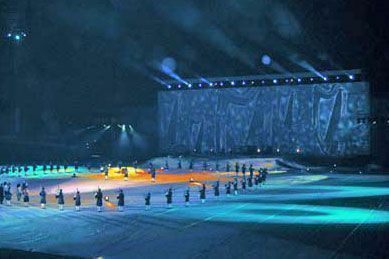 There were concerts every day in the afternoons and evenings, not to mention the Nuit Magiques, chereographed performances on a giant scale in the local football stadium – some say the Lorient Nuit Magiques were the inspiration for Riverdance. 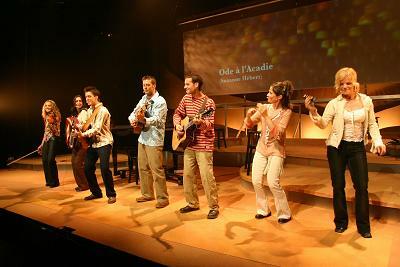 Some the most enjoyabe events were the smaller gigs in venues representing each celtic nation, from virtuoso Acadian violinist Dominique Dupuy to the local Fest-Noz (you can get a flavour of the Dupuy gigs on youtube here). On top of all this, there were sessions in some of the local pubs, with Irish, Bretons and others swapping tunes into the early hours (where yours truly comes in). The sessions were a treat for any musician, with tunes in Quay St orThe galway Inn, not to mention monster sessions with performers fresh from their gigs at the Pub Glen late into the night. This was the best part for me, as I enjoy playing music with musicians from slightly different traditions. I think folk music has an edge over other types of music when it comes to this sort of jamming – and if there is one thing better than a lively Irish session, it’s a session where there is a mix of cultures and traditions. Also, it’s very moving to hear a tune/song you’ve known your whole life played in a more minor, modal key – an older, deeper version that makes your version seem like a pale modern echo. (It’s less moving if some idiot is playing it on the bombard at 10 o’clock in the morning). Overall, this is a great international music festival – a feeling of an inheritance that is shared, yet different. I’m constantly amazed at the sheer diversity of European culture and its effect on the world…there’s a nice discussion of this on the festival website. 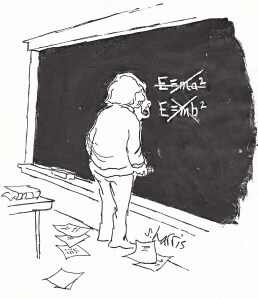 What a great week…and nobody mentioned the problem of the cosmological constant once. P.S. Hannah Caroe wants to know did I play. hi cornac, I very suprise that festival! thank you very much for everything. bye bye . Fair play duit a Chormaic. Beidh me i dteangabhail. Dean nota aS MO RIOMHPHOST AGUS SCAIP DOS NA LEADS LED THOIL. bHAIN ME AN TAITNEAMH AS BHUR GCOMHLUADAR. Hey Oisin, conas ta! Cen riomphost? Ar mo webpage? Cad is na LEADS ann? Enjoyed the write-up. want a few photos? Defo! if u can email me a few, I’ll put em up.. If I had a nickel for every time I came to coraifeartaigh.wordpress.com.. Amazing read.